Birthdays, Burns’ Nights, or ‘Any Excuse for a Party’. They all run better with bagpipes. Bagpipes provide a great party atmosphere that will always be talked about a longtime after the event is over. You don’t have to be Scottish to enjoy bagpipes at a party! The pipes are great for a surprise or for piping in the birthday cake. On one occasion, I was booked to play at a surprise birthday party. At the appointed time, I met a guest from the party (who I happened to know) and they took me into the function centre where the cake was being kept. I piped the cake into the party and realised that I knew everyone in the place. Then it dawned on me: it was my surprise birthday party! So, as a piper and a “client”, I can thoroughly recommend me! I can pipe in the cake at a birthday party or the haggis on a Burns Night. I can play the Highland Fling or the Last Waltz at your next party. I can play the National Anthem or Waltzing Matilda on Australia Day. I can play football songs on Grand Final Day or Jingle Bells at your Christmas Party. ‘A Long Way to the Top’ is guaranteed to be a hit at your next party or concert. 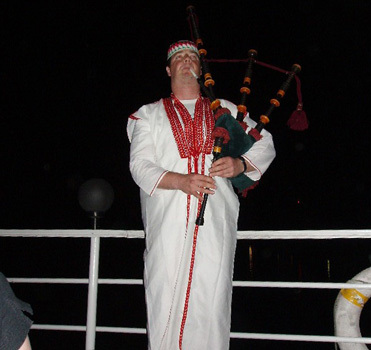 Piping for an event on the River Nile in Egypt.